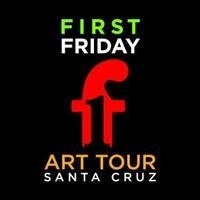 The First Friday Art Tour happens every month, rain or shine throughout Santa Cruz. Founded by the Santa Cruz Institute of Contemporary Arts, and managed in conjunction with the participating Art venues, First Friday is a free event for enthusiastic Art Goers and an opportunity for our many talented Artists to exhibit and promote their work. Stop by the SC Art Center for a lobby full of art quilts. Prices reduced. Paintings by Aia and Photography by Andrew Davis. Be sure to stop by FLORA + FAUNA at the Tannery Arts Center to see Noelle Correia's MIXED MEDIA! !